Are you ready to learn how to Recalculate through any challenge? Then you have reached your destination. The GPS Girl®, Karen Jacobsen, will bring her Aussie accent, as well as her singing voice, to NSA St Louis. 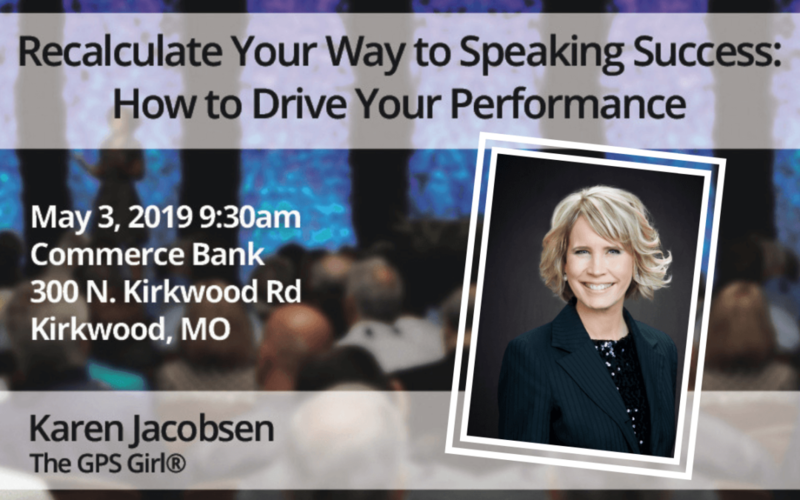 She will deliver her signature Recalculating Keynote, just as she would at an opening session for her clients, with some major speaking business additions. Karen will take us on a journey from her small town childhood near Australia’s Great Barrier Reef to becoming The GPS Girl® – whose voice is in more than a billion devices and smart phones – and building a career and business in her new home, the Big Apple. Sharing the many starts, stops, detours (and a few disasters) she encountered along her own road to success, she proves that it is never too late to Recalculate. And with her many talents, a husband, an 11-year-old son, and an international travel schedule, Karen knows a thing or two about Recalculating. So, plan to join us for this incredibly unique opportunity and event! In Mackay, Australia, 7-year-old Karen Jacobsen dreamed of becoming a professional singer and songwriter, and moving to America. Today, Karen is either creating her own dreams and making them real, or showing others how to. Realizing her heart’s desire and now New York based, Karen’s melodic, piano pop songs and powerful vocals have taken her to stages and screens across the world. Artist in Residence at High Point University, Karen’s songwriting spans across genres including pop, adult contemporary, jazz and singer/songwriter and her strong musical talents have carried her to success with her band, on 9 albums, solo at the grand piano, and as anthem singer in multiple major sports stadiums. Unexpectedly, it is her speaking voice that has garnered global attention. Karen’s voice has been heard guiding the way and giving direction on over a billion GPS units, smartphones, elevators, cruise ships and software applications worldwide. She was even the original Australian voice of “Siri”. This led to wide media coverage – including being a clue in The New York Times crossword puzzle and Harry Connick Jr calling her “hypnotic” on his talk show – and the creation of the empowerment brand The GPS Girl®, which teaches the five directions for “Recalculating” in business and life. Karen is the author of two books and speaks professionally at national and international events to motivate and breathe life into audiences. She also leads mastermind retreats and online seminars to Create Your Dream and Make It Real. Currently serving as Secretary on the Board of the National Speakers Association, Karen shares how to Recalculate when navigating change to reach your client’s dream destination.